It’s the moment you’ve been waiting for since last year; football season is finally here and with it comes fantasy football. 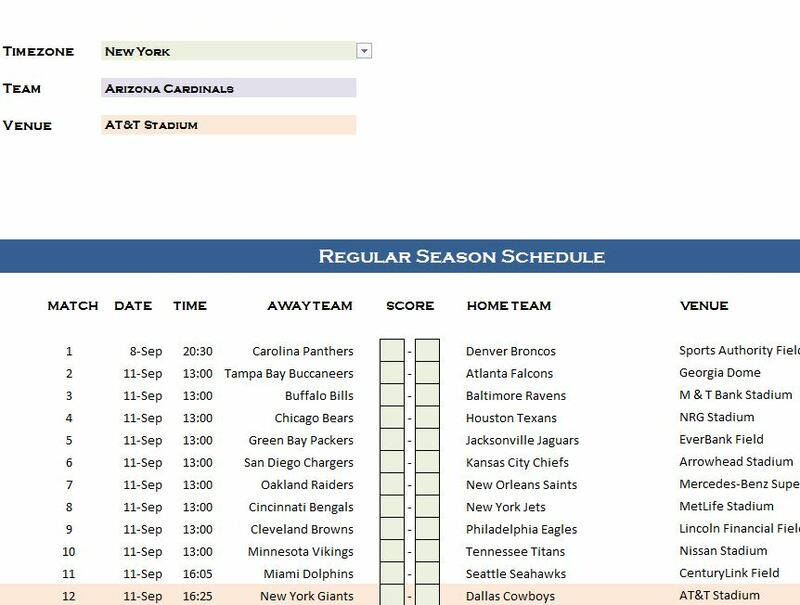 The NFL 50 Schedule is a helpful tool to organize every game and keep track of the scores as well. This free template can help you organize all the events on one page for you to use for fantasy football or simply to track your favorite’s team’s path to victory. This free template is the only thing true fans need and makes tracking your team simple and effortless, the way it should be. You can quickly enter the results of each game afterward so you can enjoy the action the way it was meant to be enjoyed, the template will take care of the rest. Clicking the link at the bottom of this template will download the document file directly to your computer. The format of this template couldn’t be simpler. You will start by listing your time zone, the team you want to follow, and the venue. You can then scroll down to the main table at the center of the page. Every team is already listed out for you to use. You just need to watch the games and enter both teams’ end scores in the boxes at the center of the template. The team that you want to track will be highlighted in the list of teams as well. To the far right of the page, you will see that after each game the template calculates the current team standings in the various tables. This template just makes it easier to follow the sport you love.